I can’t remember exactly when I first became interested in the beautiful Japanese art of bonsai. It was probably in the 1960s, when I traveled to Japan on four different occasions. On one of those trips, I climbed Mt. Fuji with friends, an exciting story for another time. At the hotel where we stayed the night before our climb, I was quite taken with their bonsai garden. Many of the trees there were over 100 years old with an incredible history. I vowed then to learn how to create these for myself. 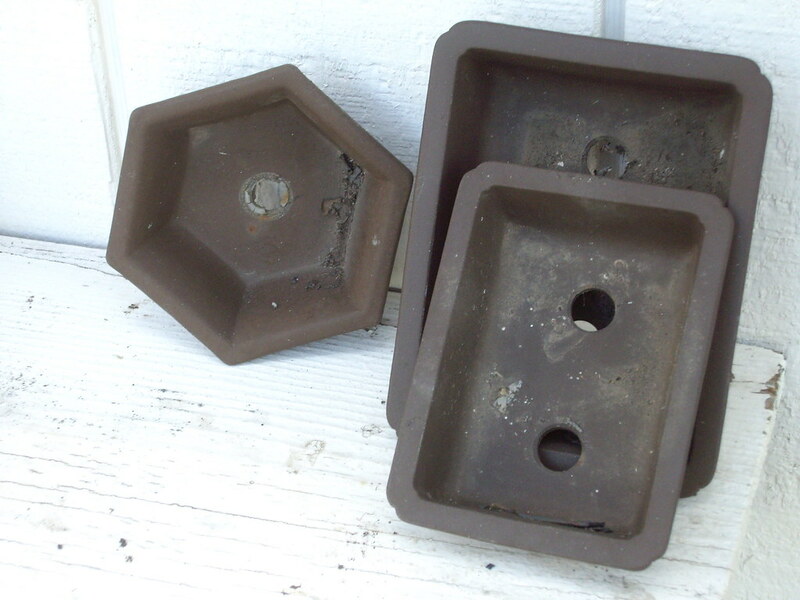 I brought home many of the “bon” or trays in which to plant the trees. They have survived many moves since that time. On one of my favorite sites, you can discuss issues with other bonsai enthusiasts, order supplies, buy bonsai books and tools, learn new techniques, and so much more. Another site offers a beautiful bonsai allegory written in 1993 by Horace A. Vallas, Jr. that can teach us how to be good managers or good parents. 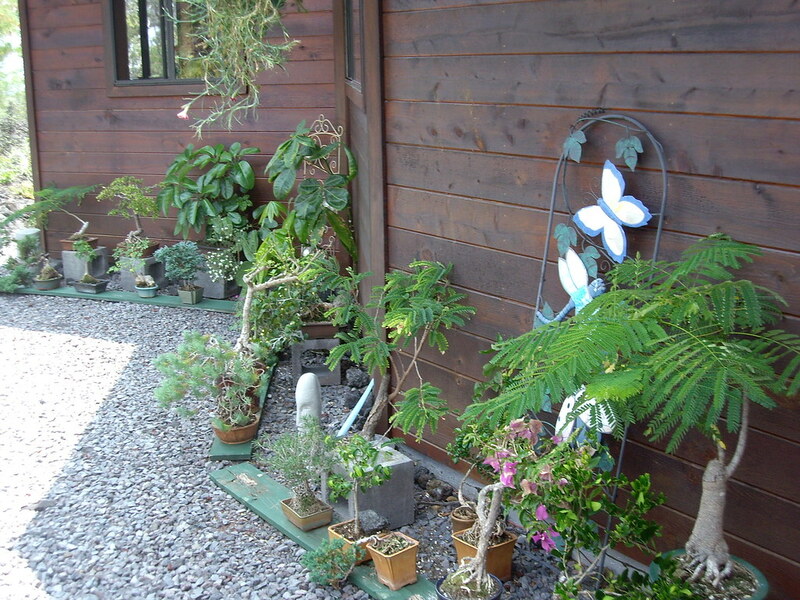 The American Bonsai Society, Inc. was founded in 1967, around the same time I visited the bonsai gardens in Japan. Their official site has many beautiful pictures of bonsai. 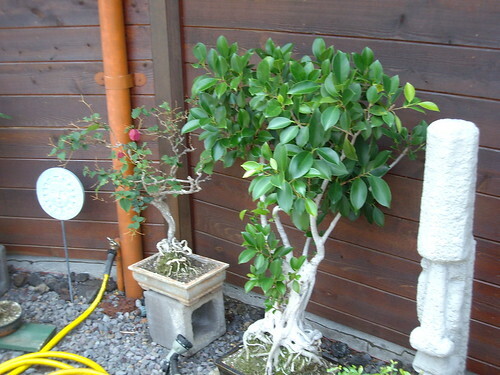 The banyan bonsai at the beginning of this post is one of many created by Carole Baker’s late husband and shown in an earlier post of her yard. Here are two more pictures showing others that he created and tended. I think you can tell from these pictures and from the websites I’ve listed that bonsai is the art of miniaturizing a tree or group of trees. Land is so precious in Japan that often the only way a person can experience nature or go into a forest is to kneel silently before a “grove” of bonsai trees in a tray. In this way, we can simply let ourselves melt into the tiny landscape and imagine walking among the trees, or be drawn into sitting at the base of an old tree. It’s difficult for me to describe this type of meditation, but it is a very effective way to put yourself into a peaceful setting, if only temporarily. 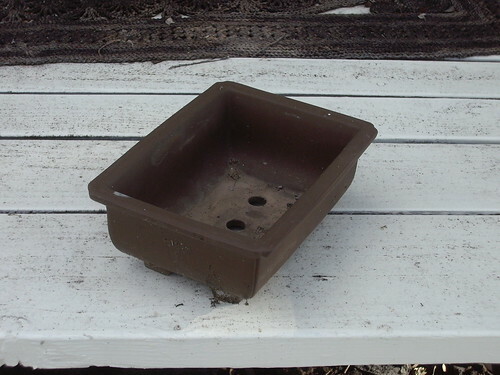 If you can imagine this pot filled with a miniature grove, then you have the ability to create one of your own. The Wikipedia site on bonsai has many beautiful pictures of not only groves and forests, but of other styles that can be produced. 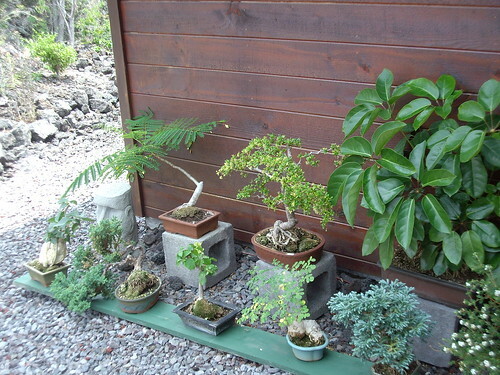 There are a variety of ways to begin a bonsai. What I talk about here is one of the methods I was taught in the 70s at Cal Poly San Luis Obispo. The roots of a bonsai are trimmed and secured to a pot or bon with a wire threaded through a wire mesh and tied around a twig underneath. This is one of my pots from an old bonsai that didn’t live. 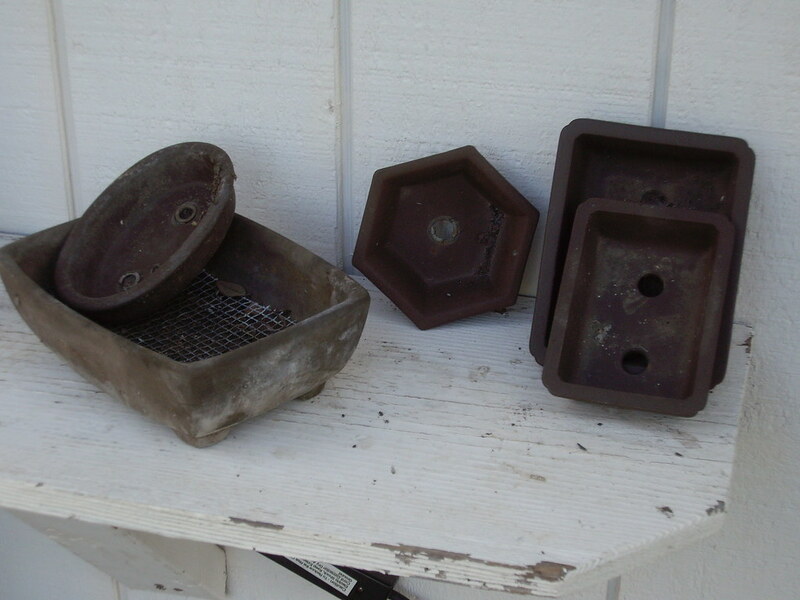 As you can see, there are many sizes and shapes for the trays, or pots. 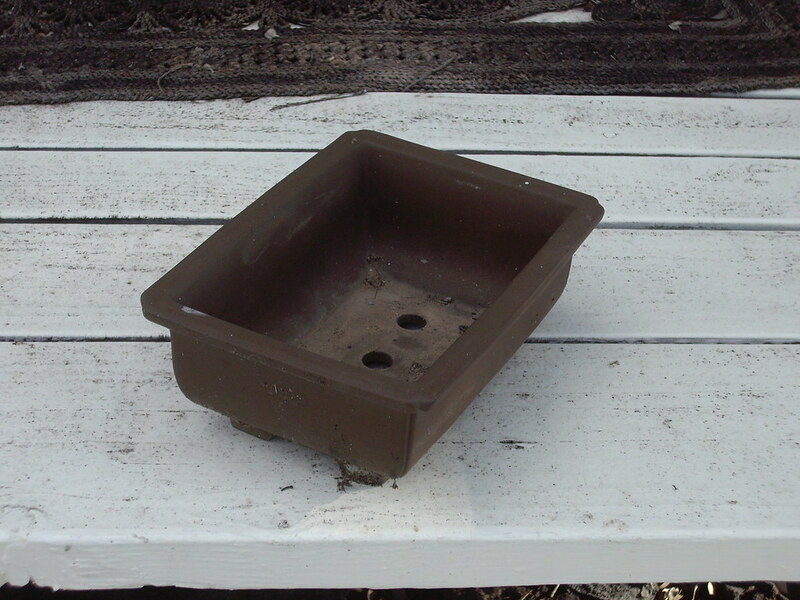 Once the plant is secured in the pot, soil is pressed around the base and roots. Try to find bits of moss, carefully lift it up and transfer it to the top of the soil. 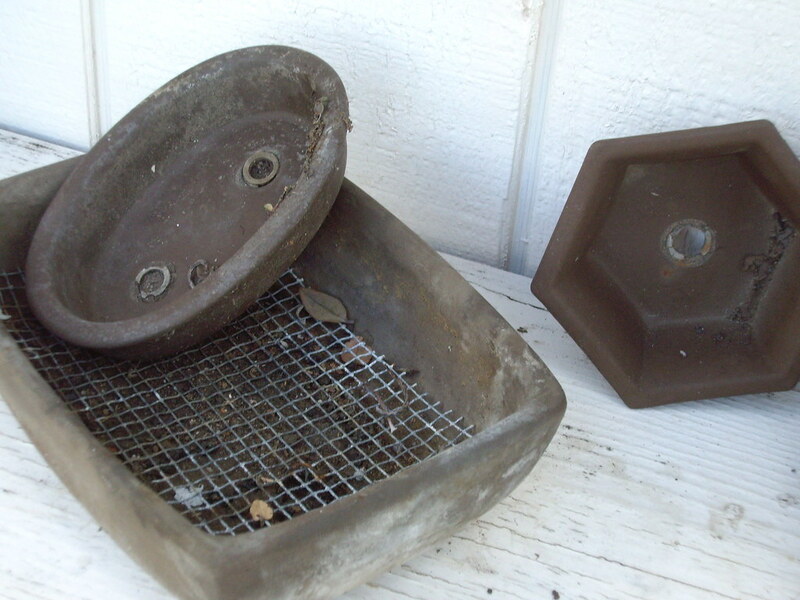 This helps to keep the soil from washing away, as well as helping to create an illusion of age. Then the process begins of trimming the tree itself to a size and shape you desire. This is not to be done in a hurry. The entire process is quite meditative and I can get completely lost in it all. There are many ways to proceed. One trick in getting the gnarled effect right away is to buy an aging root bound plant from a nursery, like a Juniper that is no longer really any good for planting in your yard. I love the ones that seem to be growing around a rock. The roots have been secured in such a way that the tree appears to be sitting on top. When I start talking about bonsai, I don’t know where to stop. There is so much to say. All I can suggest is that you get a book from the library to start out, find a nice flat tray, get a plant and just try your hand. Something else you might try is to attend one of the shows put on by the Big Island Bonsai Association. Classes may also be available. I promise you that it’s extremely addicting. Once you start, you may never be able to stop. Why would you want to? ?